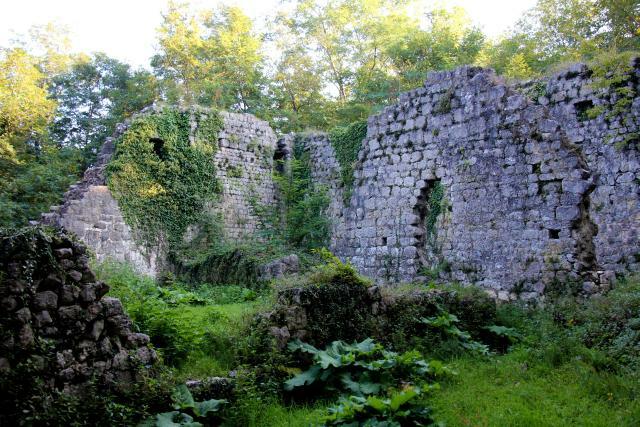 In the municipality of Vrbnik in the inner part of the island, lies hidden in between the dense forest, now abandoned ruin of a medieval fortress/mansion from the twelfth century. In that fortress stayed the Krk princes Frankopans, which by increasing their power spreaded their land even outside the island. Krk princes, like feudal lords of the island occurred at the beginning of the 12th century, when they got the island from Mlečan people. They originated right from Vrbnik, from the parent manor of Gradec above Draga Vinderska. 15 June 1388 the princes of Krk Island adopted the statute written in Croatian language with Glagolitic script. Vrbnik Statute is kept in a transcript from 1526 to 1961 in the private property of a notarial Vrbnik family Petris. Today it is kept in the library in Zagreb. Frankopans, had many mansions, and have developed many cities. On the island Krk, from which they originated, their name is mentioned in Gradec, Baška, Krk, Dobrinj, Omišalj and on the island of Košljun. On land, their name is mentioned in the historical Vinodol in the place Grobnik, Trsat, Bakar, Kraljevica, Crikvenica, Crikvenica, Ledenice, Bribir, Grižane, Drivenik, Hreljin against Senj, Bosiljevo, Brinje, Modruš, Ogulin, Novigrad, na Dobri, Ozalj, Ribnik … on the island of Krk in the seven cities associated with this surname, the least known is Gradec in Vrbnik, which is the oldest mansion. Ruins, named after the prince Nikola I, who made it build, was completed in 1323. Since the Krk prince appointed Gradec mansion with his Fatherland, we can conclude that this place was already a few generations in the family ownership of Frankopans. Gradec was abandoned in the 15th century and since then, it remained in ruins. If you choose to visit the fort in Gradec, I recommend you to stop along the way in nearby village called Stoza, and set off to visit the ruins of St.Krševan church, that was devastated because of the legend, which was talking about the buried treasure. From my experience I know that it is good if you ask for direction many times, since everything is without any marks or signposts. You can barly realize that you are in the village named Stoza, so I recommend you own a map or even better a GPS device. So when you will arrive in the village Stoza, pay attention for the first house, in the direction of Gradec. After about fifty meters from the house number 1, you will see a path that leads up the hill to the church of st. Krševan. When you arrive to the end of the road you look back, if you will see a wonderful view over the island, you know you are at the right place. You park your car at the end of this road next to some sort of building, and climb over the rocky scarp, which you can see on the picture. We walked pass the heard of sheep and soon on our left side noticed the remains of an early Romanesque church from the 12th century. When you will finish with watching the remains of the church and went back, just go right back on the road where you came from and then in the srossroad turn left towards Gradec. From there you will follow the narrow, gravel, forest road which will lead you on the crossroad, where you just follow the signpost for Gradec and continue straight ahead into the forest as far as you can go by car. 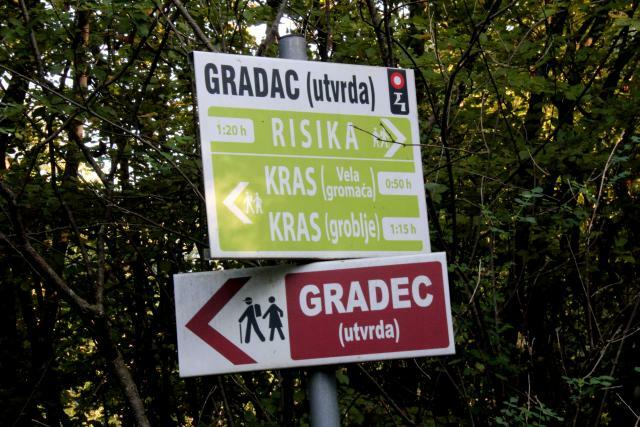 Park along the road and walk a few meters further towards the sign which indicates the trail Gradec(utrdba) and two others hiking trails : RISIKA and KRAS (watch the picture). Continue in the direction of the fort around 50 meters further into the dense forest and soon you will see the walls of the fort Gradec. The surrounding area is really abandoned and covered with green vegetation, which slowly erodes the walls. 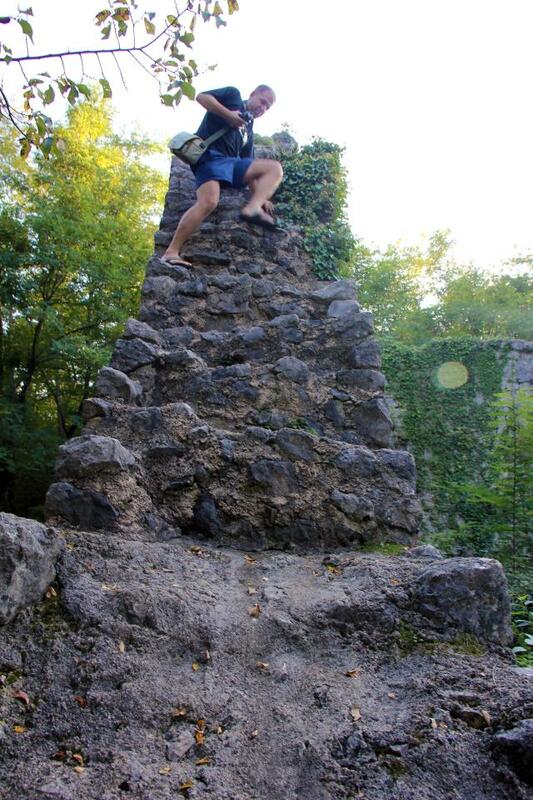 Walking around the walls and climbing it, is carried out at your own risk. The fort, because of safety reasons did not have doors. Back then they climbed into the fort on wooden structures, which they could remove in event of the attackers. At the fort you can see the remains of the st. Nikolas church, which was built in the 1325th. Again, this church is every year more covered in green vegetation. Gradec does not have a lot of visitors; I think this is due to the lack of publicity. According to the legend of buried treasure there, Gradec could become a real thematic tourist destination.